The 2001 film Amelie is wonderfully tender, gentle, warm, and any other sugary sweet adjective you can think of. And Berkeley Rep’s adaptation of the award winning film is pretty much all of that too. The smells of a bigger picture item seem to surround the world premiere of “Amelie,” playing at the Rep through Oct. 18th, already on an extension. It is a mammoth piece all about the gentle French girl who captures hearts, featuring many dazzling performances and a delicious amount of spectacle. There is something so special about the wildly misunderstood French girl, who has to deal with many, many, many eight balls against her. Start with the father who thinks she has a heart condition, forcing her parents to keep her away from anyone resembling a peer. Her mother also suffered a freak accident, causing Amelie to lose both her mother and her homeschool teacher. And coping with all the loneliness of having no friends and no classmates, a little girl who finds kinship with her goldfish Fluffy in her melancholy apartment, living with a widowed father who is quickly withdrawing from all society, save for his precious, beloved garden gnome. Despite all of this heartache, Amelie is a charmer, a loving, eccentric little lady who is on a major quest to make everyone happy, even if that might be very unclear as to how to grab some of that happiness for herself. After growing up far away from the heartbeat of her little French hamlet, it is off to waitress at the Café des 2 Moulins in Montmartre once she is of age. The pulse of this quaint café is shaped greatly by some real cards that occupy the space, a centerpiece of the 2001 film by Jean-Pierre Jeunet. There is Alyse Alan Louis’ wonderful connection with her character, the sneezy hypochondriac cashier Georgette who treats a germ like a death sentence. Randy Blair’s passionate poet Hipolito fits wonderfully in this quirky world. And a hilarious turn is created by Maria-Christina Oliveras as Suzanne, she of the tragic limp from a trapeze accident. 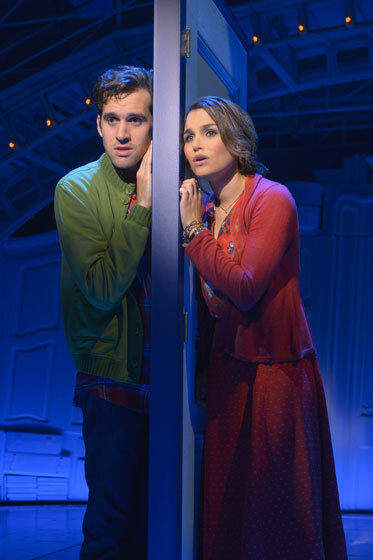 Finally, there is boyish beauty Nino, played by Adam Chanler-Berat, who, along with Amelie, makes the cutest and most awkward couple. The new musical in its world premiere moves through space with such a tender heart, with music by composer-lyricist Daniel Messé and lyricist Nathan Tysen that is melodious and warm, sung by a tight cast of harmonic singers. The play is awash in symbolism, always looking for angles to share its powerful themes. Consider the man who works tirelessly painting the same ol’ painting, all of them at various stages of development (Beautifully double-cast by Tony Sheldon, also playing fiery produce vendor Mr. Collignon). Why, after numerous attempts, is he unable to master painting the young woman in the picture, who gently drinks a glass of water? His and Amelie’s analysis of the painting propels her to investigate further her attraction to the man who collects discarded passport photo booth pictures. The play is loaded with rich humor. There is the horrid discovery of the death of Princess Diana, but a riotous tribute by Elton John singing about the loss of Amelie in a delirious fantasy in her mind. Technically, the show is masterful, with a playful lighting design by Jane Cox, full of large, vibrant colors. The projection design of Peter Nigrini has plenty of magic up its sleeve, a design that does much to allow the audience inside Amelie’s mind. The biggest difference between the film and theatre versions is really a dynamic that is hard to replicate. The film featured a romanticism of France, something that is easy for me to fantasize about since I have never been. This version does not feel terribly French, save for many references, so having some things lost in translation is to be expected. The Word: Gentle, tender and warm story of the adorable French girl and the world where she works to make everyone happy.